New term starts on April 23 (10 weeks). Registration is now open! No previous aerial experience required. 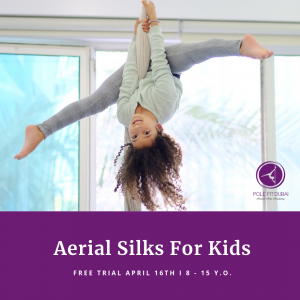 In our aerial silk class, kids will learn to fly and dance up in the air! The aerial silks, also known as tissue, originates from circus and is a fun fabric apparatus that students can climb and wrap themselves in. Children will begin with the foundations of aerial silks, learning the climbs, locks and inversions, and will eventually work their way up to drops and long sequences. Kids will work on skills that enhance concentration, flexibility, body awareness, and overall well-being. Moreover, aerial silks also promotes better balance, boosts confidence, and offers little ones a brand new sense of courage and strength! Book your space for a free trial on April 16th at 4.30 pm! Places are limited! Be the first to receive exclusive offers and the latest news on our classes and events! Our studio is located in Dubai Marina on the marina walk, within the hippest urban part of Dubai. Easily accessible by car and by metro, we are walking distance from lots of restaurants, bars and hotels and the Marina Mall.